This article was originally published on 1/11/2016. This morning, the Internet erupted with rumors that physicists have finally observed gravitational waves; ripples in the fabric of spacetime predicted by Albert Einstein a century ago. While it isn’t the first time we’ve heard excited whispers about the elusive phenomena, the gossip feels more promising in light of the recently upgraded detector at the Laser Interferometer Gravitational Wave Observatory (LIGO) that’s behind all the hubbub. In principle, detecting gravitational waves is quite simple; in practice, it’s maddeningly difficult. What physicists are trying to do is measure small fluctuations in the distance between two objects separated by a known amount. But because the atomic jitters we’re hoping to detect are so damn tiny, we need experiments that can separate objects by huge distances. Even then, we need to measure changes in distance very, very precisely. That’s the principle behind our current state-of-the-art gravitational wave detectors. In the case of LIGO, which first went online in the early 2000s, two mirrors are hung very far apart (in Richland, Washington and Baton Rouge, Louisiana), forming a primary arm, while another two mirrors are set up perpendicular to that. 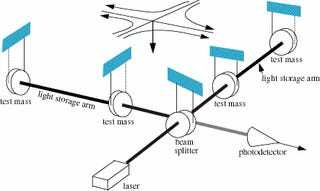 A beam of laser light is passed through a beam splitter and allowed to bounce back and forth between both arms’ mirrors, many times, before returning to its source. Simple schematic of the LIGO Detector. Via LIGO. If that happens, an electrical signal is produced— and it’s up to scientists to determine whether they just witnessed a bona fide gravitational wave. Trouble is, our planet is a noisy place, and a lot of other types of motion, from tremors in the Earth to cars and trains, can muck up the signal. The background noise of our planet, coupled with limitations imposed by the distance of the detectors, has put some serious constraints on our ability to sniff out gravitational waves from the ground. The first LIGO observational campaign, which ended in 2010, turned up no firm evidence, although we were almost fooled by a fake signal deliberately planted by the LIGO Internal Affairs commission to keep scientists on their toes. But following the 2010 campaign, LIGO underwent a series of upgrades over a five year period. When Advanced LIGO finally came online this past September, its shiny new detectors were three times more sensitive than the initial LIGO experiment. That means Advanced LIGO can now “listen” across a much vaster swath of space—up to 225 million light years away, compared with the 65 million light years distance achieved during the last gravitational wave hunt. And eventually scientists hope to boost Advanced LIGO’s sensitivity to ten times that of the initial LIGO experiment. The hunt for gravitational waves is also headed to space for the first time this year. The LISA Pathfinder, which launched on December 2nd, is a proof-of-principle experiment that’ll test fundamental technologies needed for gravitational wave detection beyond Earth. Computer model of the LISA pathfinder experimental chambers (gold boxes) and laser interferometer system (center). Via ESA. But the real reason scientists are bringing the hunt for gravitational waves to space has to do with distance. Freed from the spatial constraints of a small rocky planet, we can position objects much further apart, and in doing so cast a much wider net for gravitational waves. While the LISA Pathfinder experiment will attempt to measure the relative position of two masses separated by a mere 15 inches, a future space-based gravitational wave observatory based on LISA’s technology might do the exact same thing over hundreds of thousands of miles. Black holes, neutron stars, and other objects that don’t emit light are very difficult to study directly from our vantage point. But gravitational waves, which pass through such objects like a knife through butter, offer us a window. In probing the dark universe with gravitational waves, we might uncover new celestial wonders we never dreamed of. LISA Pathfinder, ready to launch in December 2015. Via ESA. What’s more, as fingerprints of the most energetic events in the universe, gravitational waves can help us understand how the force of gravity operates under extreme conditions; that is, near the strong field limit. There’s a lot we simply don’t know about how gravity works when very massive objects are dancing around one another at speeds approaching that of light. The rumor we heard today, that Advanced LIGO may have detected gravitational waves, has yet to be confirmed. As Gizmodo’s Jennifer Ouellette points out, it’s likely that the LIGO community won’t offer us peace of mind anytime soon. But the fact that physicists are all in a tizzy over the mere possibility speaks to the promising future for gravitational wave detection. As LIGO’s sensitivity continues to grow, and as LISA Pathfinder settles into a stable orbit at the L1 Lagrange point, we can expect many more whispers of spacetime ripples—perhaps, even some tenuous verification—over the weeks and months to come. 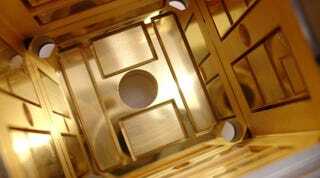 Top Image: LISA Pathfinder’s electrode housing chambers, where the first space-based tests for gravitational waves will take place, via CGS SpA.